The local market has continued to drag. Some new houses come on the market most days, but almost the same number sell and close. Net result is continued Low Inventory in all the nearby villages. The market should start to pick up in the next couple of weeks as the Spring Rush begins.I have talked to so many buyers looking for homes and they are really getting discouraged by the few choices of homes to buy. If you have ever thought of Selling, NOW is the time – prices are up and there is little competition. To the Buyers, I can only say Hang In There – your perfect home will eventually come on the market. Enjoy this great Winter weather. Note: I make a constant effort to improve the level of service I provide to you because, in my business, the most profound assets I possess are your respect and trust. Please feel free to call me if you need anything at all; I am always here to help. Best, top, most trusted and dedicated agent covering Garden City, Malverne, Garden City South, New Hyde Park, Floral Park, Franklin Square, Lynbrook, Stewart Manor, West Hempstead, East Meadow, Rockville Centre, East Rockaway, Manhasset Hills, Roslyn Heights, All of Nassau County displaying a high degree of integrity, service 24/7, professional attitude and actions. More buyers are being lured to the simplicity and affordability that small homes bring. Plus, these smaller homes are often situated within walking distance to restaurants, stores, and shops. After Sarah Susanka published The Not So Big House (The Taunton Press) 11 years ago, a groundswell of interest emerged about small home living. Tiny prefab homes began popping up on urban lots and prairie pastures alike. There was also renewed interest in downsizing the size of one’s home for the sake of simplicity. Now, with an economic slowdown and a desire to live very close to jobs and other services, the trend is just as hot now as it was then. “I call it the cappuccino factor. They want the cappuccino to be within walking distance,” says BJ Droubi, a Coldwell Banker broker in San Francisco. Homes in Noe Valley—an area she specializes in—are between 900 and 1,100 square feet. For buyers trying to play it safe in the softening housing market, a smaller home may be the way to go. Smaller homes tend to not only be more affordable but more energy efficient. As an architect, Susanka became frustrated when discussions with clients always began with square footage. “I really tried to change the discussions away from size into the things that really matter,” she says. Genevieve Ferraro shares a 1,800-square-foot house in Evanston, Ill., with her husband, two children, and a dog. “Long story short, my husband refused to move to a larger house and I couldn’t find a professional decorator who could help me design the house,” she says. 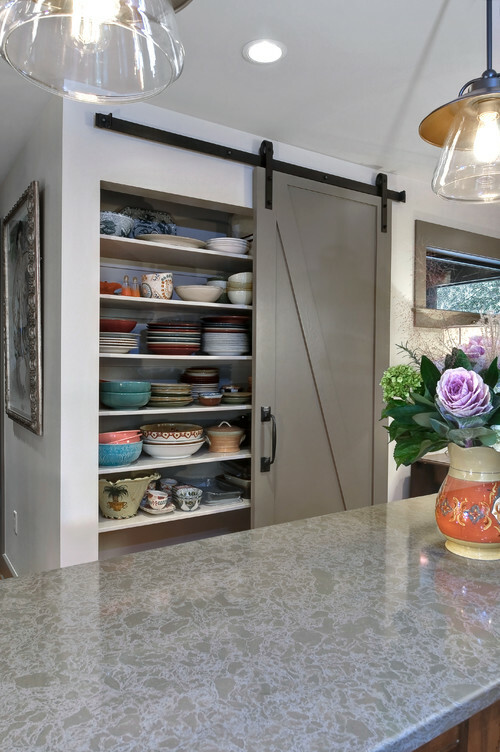 Ferraro launched a business, The Jewel Box Home, two years ago where she helps owners of small homes address storage, child-rearing, landscaping, and color choices. She works with various budgets and sometimes all it takes is just a simple rearranging of furniture to make a small space appear bigger and more cozy. Decide on the room’s primary function and let that guide your decorating. Keep color, furniture, lighting, and accessories in proportion. In other words, no large-scale pieces should be in a small room. Keep all the furnishings small and it will enlarge the space. Rearrange furniture so that the legs show on all of your upholstered pieces. This creates a feeling of space and light and allows the eye to travel across the room and see “through” furnishings. Keep tabletop accessories to a minimum. Have no more than three coffee tables and side tables. If you have a large collection of accessories, display them in rotating groups. In the historic districts and city centers of Maricopa County, Ariz., which includes Phoenix, smaller homes have only recently became affordable. A big part of their attraction is being within a short walk to restaurants, bars, shops, and other services. Tony Frantis specializes in selling homes in the Sugar House neighborhood of Salt Lake City, near the University of Utah, the state’s largest employer. Homes here—built between 1890 and 1950 and a mix of classic bungalows and Federal/Victorian style—range somewhere between 800 and 1,100 square feet and sell for $190,000 to $300,000. Some new-development communities also think smaller is better. Diane Balciar sells homes in Westhaven, a development in Franklin, Tenn.
“It’s like a Rockwell scene,” she says, referring to beautiful streetscapes (along with a dedicated person who visits homes to help with gardening), monthly concerts, a town center with shopping and dining, and a 15,000-square-foot clubhouse with a fitness center. An elementary school is on the horizon. Home sizes start at 2,000 square feet (the average is 3,200 square feet), beginning at $280,000 for a two-bedroom property. But the most popular home purchase are the smaller houses, she says. How home buyers arrive at the decision to live in a small home varies, of course. Kerri Campbell and her husband never thought they’d end up living year-round in a 480-square-foot house they built four years ago as a vacation getaway. In 2007 they sold their sizeable house in Kansas City and relocated to this rustic abode deep in the Ozark Mountains, an hour from Branson, Mo. “We were ready for a change. Our intention was to either build onto the house or build another house,” she says. They hadn’t counted on building costs to double and being forced to accept a lower asking price on their Kansas City house. So they decided to make the small house theirs. With the tighter corridors, they have less space to spread out. “It’s renewed our relationship and made us like each other again,” says Campbell, who is writing a memoir about small-house living. Indeed, many people are looking for a simpler life and a small home equates to that, says Gregory Paul Johnson, co-founder of Small House Society, which gets 25,000 visitors a month to its Web site. He points to the New Urbanism movement (which promotes walkable neighborhoods) and that more people are using cafes as their living room. Plus, appliances—especially televisions—are smaller than they once were and no longer compromise space. Peter OwenLicensed Real Estate SalespersonBetter Homes and Gardens Real Estate Atlantic Shores55 Hilton Avenue, Suite 100Garden City, NY 11530Office: (516)444-3939Cell: (516)317-2860Fax: (516)444-3940Email: peter.owen@bhgliving.comWebsite: http://www.nassaucountynyhomes.com/Best, top, most trusted and dedicated agent covering Garden City, Stewart Manor, Floral Park, Malverne, Lynbrook, Roslyn Estates, and Roslyn Heights displaying a high degree of integrity, service 24/7, professional attitude and actions. Hi Everyone Well, the August slowdown is coming to a close and September is already warming up with new houses coming on the maket. I love the Fall selling season – yards look great, the weather makes it great for buyers, and the panic buying/selling is usually over. It is a normalized market most of the time. Prices hold up nicely in the Fall too. The price levels appear to have risen a bit in Western Nassau County, not so much the higher priced homes but the lower priced homes. I have been looking a lot at Malverne, West Hempstead, Floral Park, etc and there has been a jump in what was the $400k to $500k level. This tells me there are still a lot of young and first time home buyers out there and that the overall Real Estate economy is good. Our office 55 Hilton Ave , Garden City is now open and I hope to see you there any day of the week. Enjoy September – it is my favorite month of the year. Sliding barn doors can add a modern twist to an interior space. Malte Strauss, broker and owner of Trust International Real Estate LLC in Deltona, Fla., says the barn door trend has caught on in central Florida. They can also be a great solution in modernizing the vanity area of homes from the 1970s and 1980s, which tended to have the vanity in the master bedroom rather than in the bathroom. “Now we just close those off with a barn door and buyers love that solution,” Strauss says. December is here and the market keeps rolling along – just amazing. If it doesn’t slow down, I’m going to end up showing houses on Christmas morning as I did 3 years ago – my wife was not real pleased with me. Too early to call, but I get the feeling the Spring Rush will now start in late January rather than mid February the way it did the past 2 years. In the past 5 days I have recieved 6 emails from agents, both within and outside of my own agency, pleading for new lisitngs coming on this month – they have buyers backed up just waiting for good homes. So once again, if you are thinking of selling, you are missing one heck of a sellers market right now. Lastly, visit my new Website – NassauCountyHomesNY.com which is still evolving, and let me know what you think. Well the number of new listings finally slowed down a bit, but is still well ahead of past years for this season. Still, there are only 79 houses for sale in Garden City, 35 in Malverne, 10 in Roslyn Estates, and 1 – yes, only 1 in Stewart Manor. Reason is the Buyers are still active as I have been saying for the past 4 months. Buyers just won’t go away, and are gobbling up the inventory that is out there. So if people are advising you to wait until Spring, I cannot say it enough – do NOT wait. Spring will bring a new set of buyers, but also all the Sellers who think Spring is the only time to sell. You will face much increased competition come March and who knows what the Buyer situation will be then. Lighting Primer: Don’t Be in the Dark! Good lighting can make a room look more attractive, larger, more romantic — even safer. Help home owners make smart decisions that turn buyers on. Q. How much light does a room need? A. It depends on a room’s size, color palette, and natural light and the function it serves, says Joseph A. Rey-Barreau, consulting director of education for the American Institute of Architects and associate professor at the University of Kentucky. He says most rooms should have three different layers: ambient or general lighting that gives a room its overall light, task lighting that sheds light on an area so users can perform a function such as reading at a computer, and accent lighting that focuses on a specific architectural detail, like a coffered ceiling. Q. How do home owners achieve specific effects in each room? A. They can use a mix of fixtures and lamps, depending on the room’s size and furnishings, as well as the desired brightness and color quality of the lighting, say Rey-Barreau. Home owner Suzanne Alfieri wanted different lighting than the ceiling high hats and two pendants she had before she and her husband redid their dated 1990s kitchen. John Starck, president and CEO of Showcase Kitchens in Manhasset, N.Y., added new cans with more energy-efficient bulbs that worked better with the room’s different ceiling heights and skylight. He also installed sconces with shades on either side of a 60-inch range to add a soft glow. Q: What about the type of lamps or bulbs? A: Due to the need to cut energy use, the federal government has required that certain bulbs be phased out over time, and states have instituted regulations, too. This has led to the increased use of LEDs, which are much more efficient and give off less heat than traditional incandescents. One area where they have helped greatly is in the ceiling, eliminating the “Swiss-cheese effect” caused by many cans. Though they used to cost much more than incandescents, prices for LEDs have come down – and they don’t have to be replaced as often, which helps in hard-to-reach places such as high ceilings and closets, says Ryan Ramaker, product marketing manager at Acuity Brands. Colors have also been improved to match warmer incandescents, and they work in almost all applications, both outdoors and indoors, says Michael Murphy, interior design and trends producer of Lamps Plus, a lighting retailer. Another good option is compact fluorescent lamps, which are slightly less efficient than LEDs, yet more efficient than standard incandescents. Incandescents are still useful as halogen incandescents, particularly for table lamps and recessed lamps. Other fluorescent lights are seldom used any more, says Rey-Barreau. Here are three key definitions: Lumens: Measures the amount of light produced (rather than the old method of watts, which indicated how much energy was used). A 100-watt incandescent bulb produces about 1750 lumens. Kelvins: The color of the bulb’s light. A warm, white LED usually is rated below 3000 Kelvin, while a cooler blue is typically above 3500, says Rey-Barreau. Color Rendering Index (CRI): Measures the accuracy of color from a lamp on a scale of 0 to 100. Higher numbers provide better color rendering. Many choices today are dimmable, which helps vary effects and avoid having a shopping mall ambience in a home, says Kelly Daiberl, design coordinator and real estate salesperson at Kinzie Real Estate Group’s custom homes division in Vernon Hills, Ill.
Q: What about cost? A: Rey-Barreau estimates that yearly costs are based on three hours of use daily for a year. A 13-watt CFL might cost $1.57 a year while an 18-watt CFL might run $2.17 a year for the same daily amount of light. LED bulbs cost about $15 apiece now, but might have been double two years ago. LED tape that’s one-quarter-inch is only $7 to $10 a foot and works well underneath cabinets since it’s barely visible. A 60-watt incandescent might last 1,000 hours, a typical CFL might last 10,000 hours, and a LED 50,000 hours. Q: When should lighting choices be made in the decorating or remodeling process? A: Early on, and preferably before rooms are painted, patched, or wallpapered in case wiring or outlets have to be installed or holes cut for cans, chandeliers, swing-arm wall lamps, or sconces. A good example would be cove lighting, a ceiling addition that requires concealing low-voltage strips for a nice glow, says Daiberl. Choices should also be made in conjunction with furnishing plans since it’s wise to have some type of lighting close to a sofa, chair, or bed. Too often cans are installed in a ceiling willy-nilly rather than with a purpose in the room design. Usually, 5-inch-diameter cans should be spaced 6 to 8 feet apart in a 9-foot high ceiling. Many room lighting systems allow home owners to alter moods from their computer, phone, or tablet without great cost. Q: What are some helpful tips for sellers? A: Advise home owners to be sure their electrical panel is updated to a minimum of 200 amps. Also, tell them to play up positive features such as exterior specimen trees and walkways and interior features such as furnishings, architectural structures, or artwork. Every lamp or fixture should be in good working order with the right lumens and bulbs, and fixtures should be squeaky clean. The biggest mistake home owners make is using inappropriate lighting in a room. Remember, lighting needs to change over the course of a day. Q: Finally, any trends home owners should know about? A: When it comes to fixtures, Lamps Plus’ Murphy notes a trend for antique bronze, blue hues, exaggerated sizes, floor lamps, and the continued appeal of Mid-Century Modern designs. best, most trusted agents covering Garden City, Stewart Manor, Floral Park, Malverne, Lynbrook, Roslyn Estates, and Roslyn Heights displaying a high degree of integrity, service 24/7, professional attitude and actions. A dedicated agent is the only way to go. Interesting thing happening the past 2 months in a number of villages – Prices have been rising, not huge jumps but noticeable. As I have been saying the past 4 months, the buyers have not gone away and there is still not enough inventory to satisfy the demand. Price increases are inevitable. So, If you are considering selling your home, please do not wait until Spring – your buyer is waiting out there. ItӁs not your grandmotherӁs look any more. Find out why wallpaper has a growing appeal among trendsetters and younger buyers. In recent years, wallpaper played a minor role in home décor, relegated mostly to powder rooms and otherwise pushed aside by paint, which has been considered the cheaper, faster way to freshen a room. Wallpaper also didnӁt fit the more modern aesthetic that gained hold in the last dozen years or so, says Paula Berberian, creative director at Brewster Home Fashions, a fifth-generation family-owned wallpaper manufacturer in Randolph, Mass. And some buyers considered it far too personal a choice, as well as problematic to install and later remove. But tastes change. Many younger buyers donӁt remember their parentsӁ and grandparentsӁ homes covered in floral, striped, and velvet papers and are now gravitating to wallpaper as a chic update choice. ӄThey consider it quite cool, along the lines of Mid-Century modern,Ӆ says Berberian. ItӁs even catching on in parts of the country far from the trendsetting coasts. ӄWe just finished a Parade of Homes in Boise, Idaho, and Provo Utah, and most of the high-end houses incorporated some wallpaperҼoften big, bright, bold, large-scale geometrics,Ӆ says Robyn Shea, a salesperson at Better Homes and Gardens Real Estate in Boise who retails several wallpaper brands under her other business, Design Source 101. Easier to hang and remove: Papers have been vastly improved, and are easier to hang and remove without damaging walls. Some are fabricated on a nonwoven substrate, so they make it easier to hide surface imperfections, too, says Berberian. Jackie JustӁs Murals Your Way, based in Minneapolis, are made to peel and stick, making them easier to apply, remove, and reuse elsewhere. More environmentally friendly: Many wallpapers today are made from eco-wise materials, such as water-based prints that breathe. Some with new vinyl coatings hold up better to bathroom steam and can be wiped free of dirt, grease, and fingerprints. Patterns are hipper and fresher-looking: Buyers should focus on overscaled geometrics including kaleidoscopes, Asian-inspired themes, trompe lӁoeil photorealism shots of materials such as weathered wood and brick, horizontal and chevron patterns rather than traditional vertical stripes, and faux leathers, says Jon Sherman, owner of manufacturer Flavor Paper in Brooklyn, N.Y. Colors are brighter: Think aquas, oranges, purples, greens, yellows, hot pinks, metallic silvers and golds, and contrasting white and black combos, says Jill Wagner at New York-based manufacturer Osborne & Little. Midtone pastels have made inroads, and, of course, gray, the hot neutral, makes the cut. Texture has become more pronounced: Metallics and crystals are being incorporated, as well as bits of suede, gels, beads, and cosmetic-style powders that change with light and as people move past them, says Sherman. Even Ӂ50s grass cloth has returned, but with a contemporary edge and in more than earth tones. More inventive installations: Wallpaper is going beyond just a roomӁs four walls; nowadays, itӁs viewed as a possibility for one accent wall, the ceiling, or in between ceiling beams or coffers, says Berberian. And it can be used to expand space, make it more intimate, or camouflage a problem, says general contractor Beverley Kruskol of M.Y. Pacific Builders in Los Angeles. Santa Monica, Calif.-based designer Kimball Hills of Rumba Style hadnӁt used wallpaper in years, but is doing so with white grass cloth to brighten a clientӁs burled wood wall. Price points vary: Some companies like BerberianӁs offer single rolls from $40 up, and Just provides a fully customized 8-by-0-foot feature wall mural for between $500 and $800. Dip a toe in slowly: If your clients are new to using wallpaper, they might want to start small, such as an accent wall in a bathroom, says Chicago designer Lisa Wolfe, who is a huge wallpaper fan. She also recommends it to break up large areas, or in a bedroom, entry hall, cozy den, breakfast room. Using it in a kitchen requires restraint since many equate to the dated kitchen paper of the past. TodayӁs buyers are still more inclined to tile backsplashes or paint. But if a home owners likes the idea, they should consider a perky, modern pattern. Wallpaper borders are out, says Wagner of Osborne & Little. A wallpaper whitewashing is a no-no: If an entire house is wallpapered, sellers might consider removing some before they list. And they should definitely clean or take down dirty, worn, or torn wallpaper, which is a huge turnoff. As I stated last month, the open houses we have been running have been packed with buyers. Reason is that inventory in Central Nassau and NorthEast Queens is still relatively low and the buyers are still waiting for their particular home to come on the market. So, If you are considering selling your home, please do not wait until Spring – your buyer is waiting out there. A crisp chill in the air, the turning of leaves and the scent of pumpkin spice are all hallmarks of fall. ThereӁs no doubt itӁs a beautiful season, and if youӁre planning on selling your home by the end of the year, you can capitalize on all the good work nature already provides for us. You want your home to stand out when you put it on the market, so start at the curb. To play up the fall feel outside of your home, clean up flower beds and rake any leaves off your lawnҼthe first thing buyers should notice is the changing colors on your trees, not the muddled dead leaves on the grass. Add a wreath of seasonal plants on the front door for a finishing touch. In the backyard, store away any summer items like pool floats, inflatable water slides and tiki torches. Add fall-related decor like a self-contained fire pit and warm-colored cushions on your patio furniture to create an outdoor space perfect for chilly evenings. You can also add a pumpkin to the front stoop, but donӁt carve it up because it will spoil much faster. Remember to avoid using a pumpkin altogether if the weather is bitterly cold already, as it will rot fasterҼthat will only attract flies. AutumnӁs natural color scheme is warm and earthy, reminiscent of cozy, fireside nights. To bring some of that warmth inside for your open house, fill vases with red, orange and deep yellow flowers like marigolds, Mexican sunflowers or strawflowers. Place vases in the entryway, in the master bedroom and on top of mantles to add color throughout the house. To make your home feel cozy and inviting, invest in throw blankets or pillows in the same shades as your floral arrangements. Place the pieces around your living room and bedroom to draw out the fall colors. Add dried decorations, like dried wheat or dried cornstalks, to fill in empty wall spaces with that fall feeling. The pleasant scent of fresh-baked cookies or a warm apple pie wafting through the house can trigger memories of comfort and home. To tie in with the seasonҼand the much-beloved holiday foodsҼlight some candles scented with apple spice, pumpkin spice, cinnamon, cranberries or ginger spice. Add warmth and a touch of the holidays to your kitchen or dining room by creating a cornucopia centerpiece on your table or countertop. Fill the centerpiece with gourds, miniature pumpkins and maize to help potential buyers picture themselves cooking their first Thanksgiving dinner in their new home. While adding a bit of color and warmth will help buyers picture holidays ahead, keep your decorations clean and minimal. Avoid overpowering a room with too many flowers and candles, and always remember keep personal items tucked away. Even if the piece is holiday or fall themed, buyers like to picture their own decorations in a home. Call a Top Trusted Agent in Garden City today- Peter Owen! Two months ago I led off with an article on investing in bonds, and the worry that interest rates could rise this year. I am again including an article on the effect of rising interest rates on bonds and bond mutual funds. There is more talk of inflation going on in the marketplace, which is ususally accompanied by interest rates rising. Think about how much you are paying at the gas station and food store. Please review your investment and 401k holdings to see if you are in long term(20-30 year) bond mutual funds. If so, you may want to start considering shorter term bond funds. Hopefully by now you have filed your taxes and gotten your refund. If not, you have 9 days left to mail in your tax return. You’re on your own now. You’ve finished school, are working your first real job, and maybe you’re even buying a home or getting married. Here are a few tips to help you start managing your finances. Over the last several years, investors have grown accustomed to historically low interest rates. But what happens when the trend reverses? But often times, we think we’re covered for losses by insurance when, in fact, we’re not. So here are some common coverage gaps to think about when reviewing your own insurance coverage. What health-care changes become effective in 2011? The Patient Protection and Affordable Care Act makes significant changes to our health-care delivery system. Many of these changes take place in 2011. Are some preventive care services free? Generally yes. Under the Patient Protection and Affordable Care Act (PPACA), certain preventive care services are available to you and your family at no cost. The information in any newsletter or within the website should not be construed, in any manner whatsoever, as the receipt of or a substitue for personalized individual advice from Trendline Financial Solutions. Advice may only be given after client has received a copy of the Firm’s Form ADV on file with the New York State Dep’t of the Attorney General, appropriate Firm disclosures as required by Law, and entered into a Financial Planning agreement with the Firm.